The crisp winter air, crystal clear icicles, and beautiful blue sky make the winter season a wonderful time for a wedding. 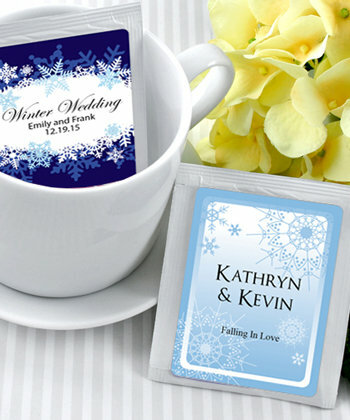 The winter themed personalized tea wedding favors are distinctive and elegant additions to your reception. A single black tea bag is enclosed in a 2.5" x 3" glossy envelope with five different designs. You can have these unique wedding favors printed with your names and wedding date in two to six business days. Your guests can relax and discuss your wonderful day with a soothing cup of tea and remember just how beautiful an event it was.